​That was much quicker than we all expected. 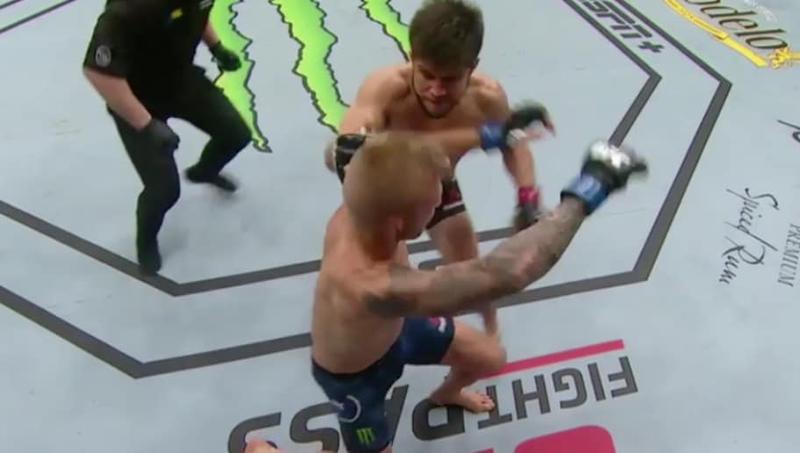 After a little over 30 seconds into the first-round of Saturday night's main event at ​UFC fight night in Brooklyn, Henry Cejudo took down TJ Dillashaw thanks to a well-timed shot to the temple. With the win, Cejudo holds on to his flyweight championship belt. ​​Cejudo's strategy was clear from the outset--there is no feeling out process with this guy. After a few early shots to send Dillashaw off-balance, he finished the job with a brutal punch straight to the temple. In two straight fights, Cejudo has now beaten Dillashaw and Demetrious Johnson. The 30-second bout is one of the quickest TKOs in a title fight EVER. Henry Cejudo has now beaten Demetrious Johnson and TJ Dillashaw back-to-back. Crushed Dillashaw tonight. Impressive. ​​Fight night had plenty of fireworks. In this case, ​we hope you didn't blink during the main event.